Few things can make your life as uncomplicated as a good dishwasher. Conversely, a bad one will ruin whatever semblance of peace an order you house has. The dishwashers I'm showing here are from KitchenAid, who couldn't make a bad dishwasher if they wanted to. Mercifully, they don't want to. KitchenAid is not the best brand out there but they do make a pretty great appliance. At the lower end of its price range, it will out perform anything else you'll see for the same money. At the top of their line, they hold up pretty well to Bosch. In realm of thousand dollar dishwashers, KitchenAid and Bosch are neck and neck. Beyond the thousand dollar threshold, it's Bosch all the way. Anyhow, let me run through some dishwasher basics before I start testifying. In the mid-seventies, my mother got her first dishwasher. It was a portable model as were most of them back then. We wheeled it over to the sink and hooked it up to the kitchen faucet. When it was done, we wheeled it back. Believe it or not, you can still buy a portable dishwasher. I cannot imagine who would want one, but there are still a few of them out there. In 2008 though, most dishwashers are built in. They are usually the only built-in appliance in most American homes. You can spend anywhere from a couple hundred to a couple thousand dollars on one. The more more money you spend, the better the appliance, obviously. At the low end they are noisy and inefficient. At they high end, they are so quiet you cannot tell whether or not they're turned on. It's counter-intuitive, but a modern dishwasher uses less water and electricity to wash dishes than handwashing does. Aesthetically, dishwashers start at the low end of the market with the controls on the front door of the appliance, like this first one. In a model such as this one, they are sold in white (do people still buy white appliances? ), black, an off-white the industry calls "biscuit," and stainless steel. Some of these controls-on-the-front models will accept a wooden panel, but most won't. Most of the models you'll find in a home center are in this style. If you do some searching around and if you see enough high-end models, the controls on the front start to look dowdy and old-fashioned. A newer and cleaner version of this old design is an integrated door. An integrated door has the controls hidden on the top rim of the door. When the door is closed, you can't see any controls, just a sleek door and handle. They will be available in the same basic colors as the lower end models, but you will be hard pressed to see one in a showroom in anything but stainless steel. Some integrated models are designed to accept a wooden panel and cannot function without one in place. 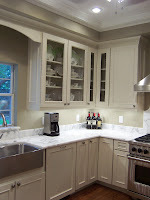 An integrated panel in the door style of the surrounding cabinetry will make a dishwasher disappear effectively. In the photo below and to the left, there is an integrated dishwasher to the right of the sink. What it's hiding is a $1400 Bosch dishwasher that's so quiet it shines a light on the floor to let you know that it's running. Sweet! Be warned though, a coordinated cabinetry panel for a dishwasher will add a couple of hundred dollars to the price of an already-spendy appliance. I've seen them disguised as full-height doors as is this one, and I've seen them masquerading as door/drawer combos and sometimes as banks of drawers. A couple of years ago, a New Zealand-based appliance manufacturer called Fisher-Paykel (Paykel rhymes with "Michael," so be sure you sound like you know what you're talking about if you ask a dealer about them) introduced a new concept in dishwashers called a drawer dishwasher. (http://www.fisherpaykel.com/) Fisher-Paykel drawer dishwashers are slick and the idea of a drawer dishwasher makes a lot of sense when you look at how people actually live. 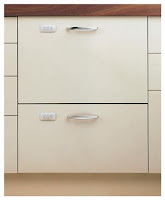 They come as either two stacked drawers, or as separate drawers that can be placed in different areas in a kitchen. For single people, having the option to do a half load of dishes is a more efficient and sanitary practice than letting dishes sit until you've accumulated a whole load. For households of more than one or two, you can split the functions of the two drawers. Pots in pot scrubber mode in one drawer and glassware in the glassware mode in the other drawer. Fisher-Paykel had the drawer dishwasher idea to themselves for a couple of years until four years ago, when KitchenAid came out with a knock-off. The KitchenAid is not as good an appliance, but that's as much a function of this being a new product for them as much as anything. The double KitchenAid in stainless steel is to the left and the Fisher-Paykel with integrated panels is to the right. Both manufacturers offer single drawer options as well. 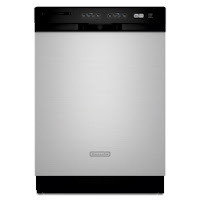 The single drawer dishwashers are great to use in a bar or in some other part of the house. I've also used them singly in kitchens for small families or single people with one drawer to the right of the sink and the other drawer on an island. 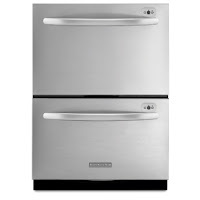 Fisher-Paykel makes some really great stuff and they are going after the American market like gangbusters. I'll get into some of their offerings when I get into honors-track appliances later. But at KBIS (our big indistry show) in Las Vegas last spring, they rolled out a gas cooktop they call the Luna that I still can't believe I saw with my own eyes. The Luna is a glass cooktop and when you turn it on, lit gas burners rise from the surface of it. I can't describe it very well, but their website goes into it in some detail. 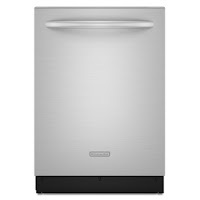 Go to their press release, http://www.fisherpaykel.com/press/pressreleases/luna.html and read about it for yourself. Amazing, absolutely amazing.